WAITE: Folly, mania, extravagance, intoxication, delirium, frenzy, bewrayment. Reversed: Negligence, absence, distribution, carelessness, apathy, nullity, vanity. Reversed: Hesitation, Instability, Trouble arising therefrom. ETTEILLA: FOLLY (78 or 0)Demented, Eccentricity [Extravagance], Insanity, Aberrations, Intoxication, Delirium, Frenzy, Defective, Rage, Carried Away. Enthusiasm.Blindness, Ignorance.Crazy, Insane, Irrational, Innocent, Without Affectation, Simpleton. Reversed: Imbecility, Ineptitude, Carelessness, Stupidity, Imprudence, Negligence, Absence, Distraction.Apathy, Fainting Fit, Exhaustion, Sleep, Nothingness, Nullity, Empty, Nothing.Vain. Illustration (above): Folie [Folly], adapted from Le Grand Etteilla (after Etteillas original deck, c. 1788), published by Grimaud. WAITE: Skill, diplomacy, address, subtlety; sickness, pain, loss, disaster, snares of enemies; self-confidence, will; the Querent, if male. Reversed: Physician, Magus, mental disease, disgrace, disquiet. MATHERS: THE JUGGLERWill, Will-Power, Dexterity. Reversed: Will applied to evil ends, Weakness of Will, Cunning, Knavishness. ETTEILLA: ILLNESS (15), Infirmity.Trouble, Sadness, Anguish, Evil, Displeasure.Harm, Pain, Misfortune, Disaster. Reversed: Mental Illness, Head Injury, Unfortunate Situation, Disgrace, Trouble, Anxiety [Disquiet], Affliction.Physician, Magician. 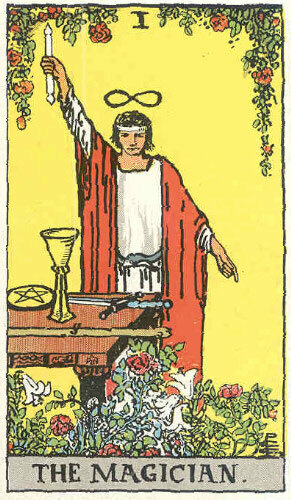 Illustration (above): The Magician, from an early edition (c. 1910) of The Rider Tarot Deck by Waite & Smith, first published by Rider in 1909 (from the private collection of Holly Voley). Click the image for a larger one. WAITE: Secrets, mystery, the future as yet unrevealed; the woman who interests the Querent, if male; the Querent herself, if female; silence, tenacity; mystery, wisdom, science. Reversed: Passion, moral or physical ardour, conceit, surface knowledge. MATHERS: Science, Wisdom, Knowledge, Education. ETTEILLA: FEMALE QUERENT [CONSULTANT] (8)The Woman Who Most Interests the Querent, if MaleNature, Rest, Peace and Quiet, Retreat, A Withdrawn Life, Alone, Retirement.Temple of Heat, Silence, Tenacity. Reversed: Reproduction, Garden of Eden, Effervescence, Bubbling, Fermentation, Ferment, Levin, Acidity. WAITE: Fruitfulness, action, initiative, length of days; the unknown, clandestine; also difficulty, doubt, ignorance. Reversed: Light, truth, the unravelling of involved maters, public rejoicings; according to another reading, vacillation. MATHERS: Action, Plan, Undertaking, Movement in a matter, Initiative. Reversed: Inaction, Frittering away power, Want of Concentration, Vacillation. ETTEILLA: NIGHT (6)Obscurity, Darkness, Lack of Light, Night Scene, Mystery, Secret, Mask, Hidden, Unknown, Clandestine, Occult.Veil, Symbol, Figure, Image, Parable, Allegory, Mystic Fire, Occult Science.Hidden Machinations, Mysterious Intervention, Clandestine Actions.Blindness, Confused, Cover, Wrap, Difficulty, Doubt, Ignorance. Reversed: Day, Clarity, Light, Brilliance, Splendor, Illumination, Manifestation, Evidence, Truth.Clear, Visible, Luminous, Grant the Day [Donner le jour], Seize the Day, Make Public, Make Appear.Pierce, Coming of Day, Brightened Up, Acquire Knowledge.Expedient, Easiness.Opening Up, Window, Gap, Zodiac. Illustration (above): LImpéatrice [The Empress], from Ancien Tarot de Marseille by Marteau (1930), copyright &COPY; 1980 Grimaud. 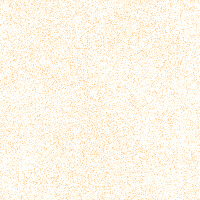 Click the image for a larger one. 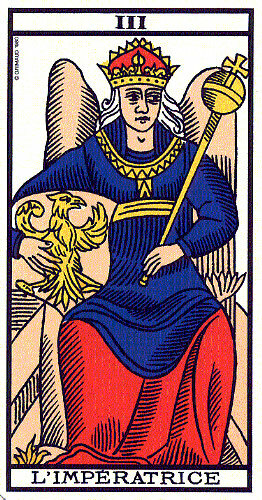 WAITE: Stability, power, protection, realization; a great person; aid, reason, conviction; also authority and will. Reversed: Benevolence, compassion, credit; also confusion to enemies, obstruction, immaturity. Reversed: Stoppage, Check, Immature, Unripe. ETTEILLA: SUPPORT (7)Aid, Prop, Flying Buttress, Column, Base, Footing, Foundation.Principle, Reason, Cause, Subject, Stability.Assurance, Persuasion, Conviction, Surety, Security, Confidence, Certainty.Help, Assuagement, Assistance, Protection.Relief, Consolation. Reversed: Protection, Influence, Benevolence, Kindness, Charity, Humaneness, Goodness, Commiseration, Pity, Compassion, Credit.Authorization. WAITE: Marriage, alliance, captivity, servitude; by another account, mercy and goodness; inspiration; the man to whom the Querent has recourse. MATHERS: THE HIEROPHANT, or POPEMercy, Beneficence, Kindness, Goodness. Reversed: Over-kindness, Weakness, Foolish exercise of generosity. ETTEILLA: MARRIAGE (13)Union, Joining, Assembling, Bond, Alliance, Chain, Slavery, Financial Straits, Captivity, Servitude. Reversed: Society, Contacts, Alloy, Blending, Compounding.Peace, Concord, Accord, Harmony, Correct [Good] Understanding. WAITE: Attraction, love, beauty, trials overcome. Reversed: Failure, foolish designs. Another account speaks of marriage frustrated and contrarities of all kinds. MATHERS: Wise Dispositions, Proof, Trials Surmounted. Reversed: Unwise Plans, Failure when put to the test. Illustration (above): Gli Amanti [The Lovers] from Tarocco Soprafino di F. Gumppenberg (1835), republished by Il Meneghello. WAITE: Succour, providence; also war, triumph, presumption, vengeance, trouble. Reversed: Riot, quarrel, dispute, litigation, defeat. MATHERS: Triumph, Victory, Overcoming Obstacles. Reversed: Overthrown, Conquered by Obstacles at the last moment. ETTEILLA: DISSENTION (21)War, Dispute, Disruption, Troubles, Riots, Unrest, Battle, Fight, Combat.Arrogance, Haughtiness, Vanity, False Glory, Pomp, Ostentation, Daring, Temerity.Violence, Disorder, Anger, Injury, Abuse, Presumptuousness, Vengeance. Reversed: Unrest, Racket, Quarrel, Disagreement, Contesting, Lawsuit, Harassment, Debates. WAITE: Power, energy, action, courage, magnanimity; also complete success and honours. Reversed: Despotism, abuse of power, weakness, discord, sometimes even disgrace. MATHERS: (11)Power, Might, Force, Strength, Fortitude. Reversed: Abuse of Power, Overbearingness, Want of Fortitude. ETTEILLA: STRENGTH [FORCE] (11)Heroism, Magnanimity, Greatness, Courage.Ability, Power, Empire, Powerful Influence.Mental Work, Patience, Resignation. Reversed: Sovereign, Kingdom, State, Republic, Government, Administration, Reign, Despotism, Sovereignty, Supreme Power, Arbitrary Power, People, Nation, Weakness, Imperfection, Quarrel [Discord]. Illustration (above): La Force (Strength) from Antichi Tarocchi Bolognesi di Giacomo Zoni (c. 1780), republished by Lo Scarabeo. WAITE: Prudence, circumspection; also and especially treason, dissimulation, roguery, corruption. Reversed: Concealment, disguise, policy, fear, unreasoned caution. ETTEILLA: TRAITOR (18)Treason, Disguise, Dissimulation, Hypocrisy, Deceiver, Corrupter, Seducer.Trickery [Roguery], Impostor. Reversed: Hermit, Anchorite, Hidden, Concealed, Disguised, Clever, End. WAITE: Destiny, fortune, success, elevation, luck, felicity. MATHERS: Good fortune, Success, Unexpected Luck. Reversed: Ill Fortune, Failure, Unexpected Ill-Luck. ETTEILLA: FORTUNE (20)Happiness, Felicity, Improvement, Enhancement, Prosperity.Advantages, Riches, ProfitsGifts, Favors.Fate, Destiny, Adventures, Good Fortune. Reversed: Increase, Expansion, Abundance, More.Development, Growth, Production. Green indicates passages from Waite which does not parallel those of Etteilla but does parallel those of Mathers, in the opinion of the editor.